By 1922, running an Annual Fete was obviously a well established event in the Brigade's calendar. This one taking place at Springhall, Vantorts Road. The Owner at the time was a Mr. John Bussey, a name that does not seem to crop up elsewhere in connection with the Fire Brigade (See footnote 1). Springhall remains but the grounds have diminished to some extent with, I believe, two houses having been built on the upper part of the main gardens close to Vantorts Road and presumably part of "Greenstead" forms part of what was once the rear gardens. As a small boy I remember it with quite extensive grounds, particularly to the rear of the house running out towards the rear gardens of houses in Springhall Road! One of the houses in Springhall Road, backing towards the Main House, was owned by Springhall and housed their full time gardener. There was a reasonable size lake to the West of the house which presumably remains. I believe it was fed by a spring, the lake overflow running into a ditch in the field on the East side of Vantorts Road. Hence the ability to have events at the fete over water. Footnote 1: Springhall later became the home of R. Marven Everett - see Chief Officers. Footnote 2: These were the days when most Hydrants and Suction connections (and I believe leather hose couplings) had what was known as a 'V' thread. Later, all threads were 'Round' which almost eliminated cross threading! Sawbridgeworth continued to have a few 'V' threaded hydrants until the late 1940's, possibly into the early 1950's, which necessitated two types of Standpipe being carried on appliances or, conversion extensions. There was also a third type of Standpipe in some of the outlying districts, being the bayonet type, which had two lugs and which was secured on the hydrant by a 90o or half turn. The cutting to the left (below) is a newspaper article, the column of which measures almost 18" (450mm). Among the entertainers is a Miss Mabel Constanduros, who was a well known actress and radio entertainer(##) - the Internet shows that her involvement in films included an appearance in Stars On Parade(1936), an Old Mother Riley film. She also wrote a couple of monologues for Stanley Holloway "Sam's Medal" and "Old Sam's Party". Frank's Prize money for drilling results amounted to 11/- (55p), probably well worth having in 1921. (##) Mabel Constanduros, birth name Mabel Tilling, was an English actress and screenwriter. She achieved fame playing Mrs.Buggins on the radio programme The Buggins Family, which ran from 1928 to 1948. Concert and Prize Distribution October 23rd 1923. Held at the Joinery Works Institute (Walter Lawrence and Son Limited). Dancing was from 8pm to 2am and about 90 people attended. Other than that the event was held on a Thursday there is no mention of the actual date. The Venue was the Church House - the corner of Church Street and Vantorts Road - which was, it seems, ornately decorated for the occasion. From the newspaper report of comments by Second Officer F. Markwell of Bishop's Stortford brigade, it seems that Sawbridgeworth had won a major competition for smartness at Southall in West London during 1923! This time the venue had changed to the Assembly Hall in Station Road which was on the North side of the road, opposite the King George IV Public House. 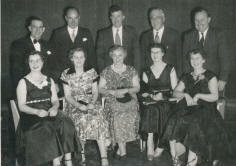 One of the entertainers was Mr. Charles Edwards, the owner of Edwards Flour Mill at Bishop's Stortford. He was very well known and respected for his singing ability in the area. Although Frank Wright (and others) had again won several prizes, by this time the excitement of the value of these had worn off as this was no longer recorded in his notes. A Recitation for 1927. 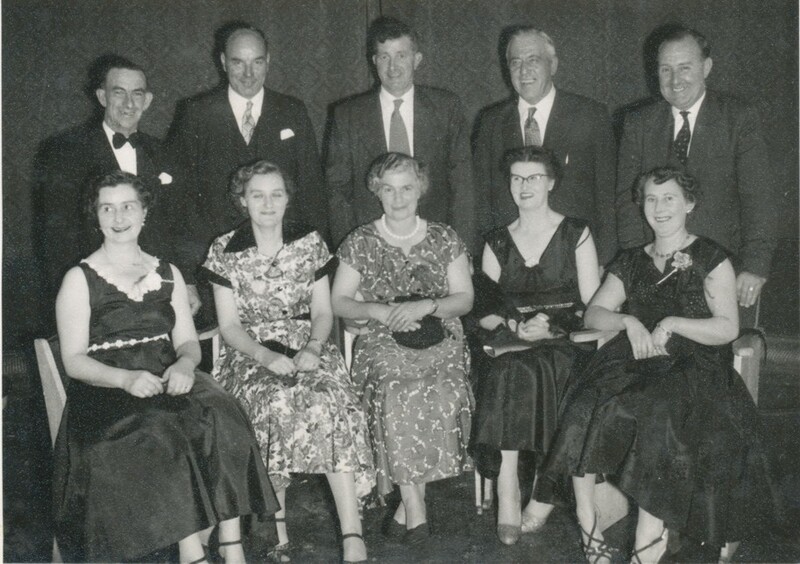 Although the memorabilia shown below is not of this particular year this is typical of what I believe became traditional with the Concert and Supper type events that continued right up to 1939. Written especially for the occasion these 'ditties' or Recitations were a speciality of Josh Brace who, I believe, was a foreman at the then famous Rivers Nurseries on the corner of London Road (Bonks Hill) and High Wych Road. 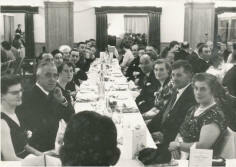 Supper and Concert 1925 - there is no actual date recorded but it is assumed to be January. The Venue was again at the Church House. This time the inspection of the brigade had been undertaken by a Major Woods - who it seems doubled as an entertainer, known as a "Humorist" - today's comedian presumably. Most of the then Firemen get a mention here! Later in 1925, on June 14th a Church Parade was held at which Ely Silver Band were present. Unfortunately, there are no further details about this particular annual event. The Concert and Prize Distribution evening took place on October 14th 1925 but again there is no supporting Press record of this. Frank had recorded though that his own prizes were related to: 1 Man Manual - 2nd; 1 Man Steamer - 3rd; 1 Man Manual (Kirkby Cup) - 2nd and 5 Man Manual - 1st. Again, there is no actual date recorded but it is assumed to be January. Venue - The Church House. Venue - The Assembly Hall, Station Road. A small Window poster drawing attention to the annual Entertainment and Prizes for 1928. The picture above was taken at the Memorial Hall in the Forebury, late 1950's or early 1960's. 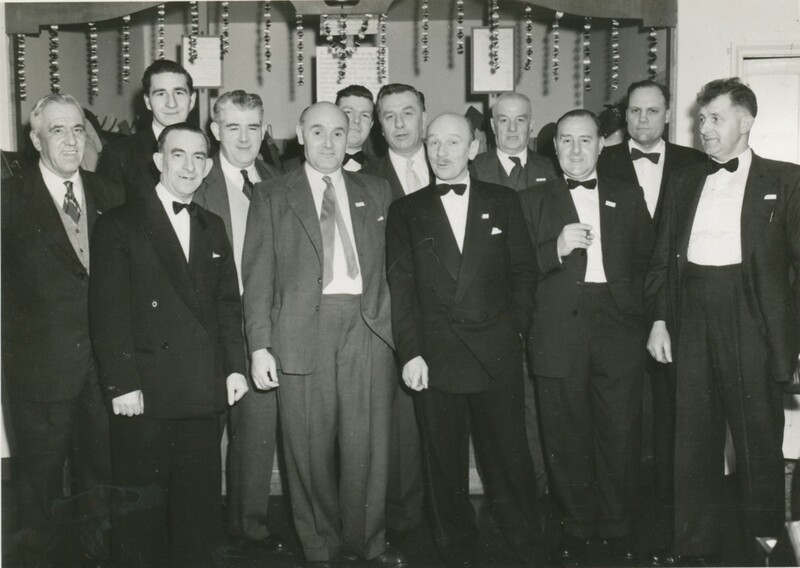 These events were still being run on an annual basis for which any profits were for the National Fire Brigades Benevolent Fund. The Dance Band was usually Jay Dimmock and His Band in which Frank Wright's Brother-in-law was a saxophonist. They were a very popular dance band of the day based on the Hoddesdon area. 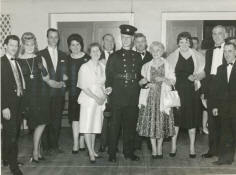 At the Brigade dance at the Memorial Hall in 1959 in aid of the fund mentioned above, tickets were on sale @ 5/- each! 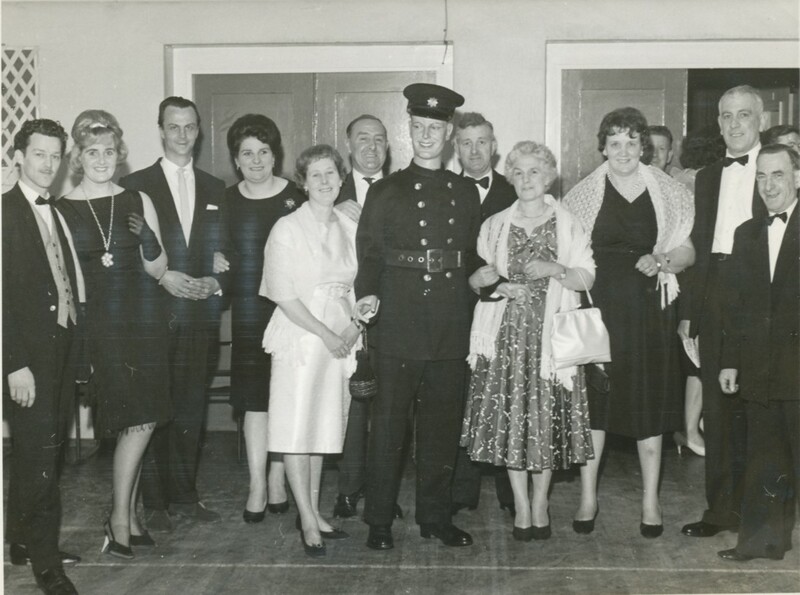 Another annual event that commenced about 1952 was a Hertfordshire Fire Brigade Dinner and Dance, for which a contingent were invited from each Station in the County. Most of them took place in the West of the County to secure a venue of sufficient size. 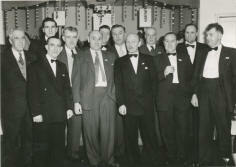 This is possibly Welwyn Garden City but Hatfield and Stevenage were others.